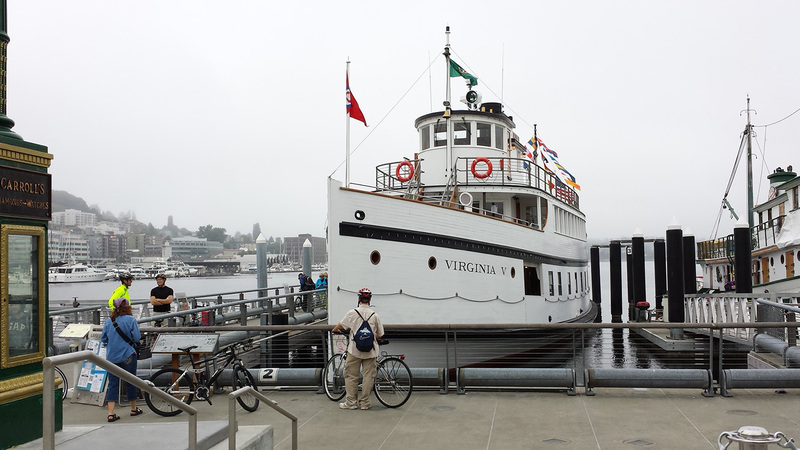 A couple of weeks ago we boarded Seattle’s historic steamer, Virginia V, at Lake Union and sailed to Bainbridge Island. The Virginia V is quite an experience. You really get the feeling of traveling in another time. And she’s so quiet. Gliding through the ship canal she barely made a sound. She was built in 1921 and became a part of what was then known as the “Mosquito Fleet,” a group of hundreds of small vessels that plied Puget Sound in the era before state-run public transit. All the vessels were privately owned, initially unregulated, and often competed for business on the same routes, with the first ship to the dock getting the lion’s share of the fares. The Virginia V is powered by a 400-hp, double-expansion, three-cylinder steam engine, built in 1898. The 115-year-old engine has a maximum RPM of 200, although it mostly spins at about 80 or 90 RPM. She used to be oil-fired but today burns diesel to develop steam. Our route took us down the Washington Ship Canal and through the Chittenden Locks. Lake Union is at a higher elevation than Puget Sound, hence the need for the locks. Locking through is a neat experience. The huge, steel doors of the lock were open at one end as we came into the locks, then shut behind us. The water was then drained out of the lock as the ship dropped about 25 feet down. The doors at the other end of the lock were opened, and out we went, into the Sound. The Virginia V doesn’t sail very often—she is crewed solely by volunteers. If she has a trip scheduled, and you happen to be in Seattle, make of day of it. It’s a very unique and enjoyable experience. Read further for a gallery of photos from our day aboard, as well as a quick video.